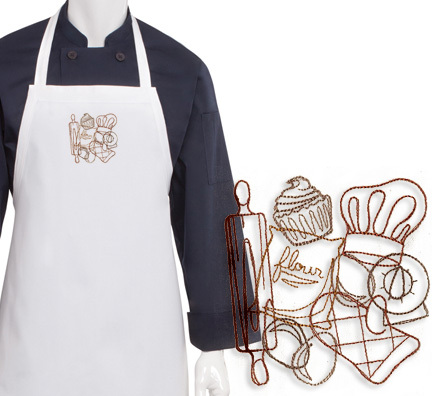 Create a unique Apron with this embroidered Baking Collage logo and transform it into a designer classic. The design will be embroidered on the bib in the centered position. It features a compilation of baking necessities, like eggs, an oven mit, chef hat, rolling pin, flour, timer and a cupcake in shades of milk chocolate, mocha and chestnut.